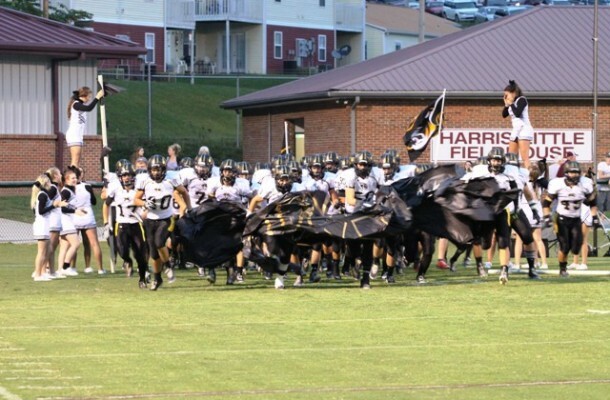 After White County got the best of DeKalb County last year, the Tigers were able to squeak out a win as they traveled to White County High School on Friday night. Last year the Warriors were able to win the game with their strong run game but this time the Tigers defense held the Warriors to 193 rushing yards versus last year’s rushing yards over 400 in the matchup. The Tigers won the coin flip and chose to defer to the Second Half. The Tigers kicker, Matthew Poss, kicked the game off with a 54 yard kickoff when Warriors took over the ball on the DeKalb County’s 38 yard line due to a Warrior penalty. White County offense completed one First Down conversion before being stopped on a 4th and 5 play by the Tigers defense. DeKalb County offense took the field starting off with a 3 yard carry by Luke Boss that was followed up with a 12 yard pass to Aaron Patterson for the Tigers first down. But after a short gain on a run by boss the Tigers were forced to punt on a 4th and 7. The Warriors took over and on just 6 plays they marched the ball down the field 71 yards for the first touchdown of the first quarter. The Warriors kicked the ball off to the Tigers and started their possession on the 23 yard line. The DC quarterback, Steven Jennings took control of the offense from there with a hand-off to AJ Mooneyham for a gain of 14 yards, then an 11 yard gain on a pass to Lane Ball and a 17 yard pass to Dustin Halfman. The Tigers drive was finished off on a 28 yard pass play from Jennings to Halfman for DeKalb County’s first touchdown of the game. The point after attempt was good by Poss leaving the teams tied at 7-7. 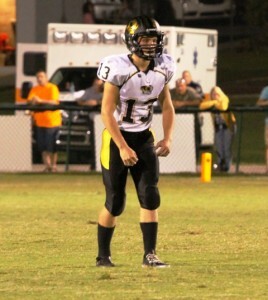 White County received the kickoff but after 3 plays they were forced to punt to the Tigers. On the first play of the Tigers possession quarterback Jennings kept the ball on the QB sneak to get a Tigers first down on a 15 yard gain. But in the next set of downs the Tigers were faced with a 4th and 13 lined up in punt formation but the ball was snapped to Aaron Patterson who connected with Jesse Smith for 8 yards leaving them short of the 1st down marker. White County took advantage of the ball being in mid-field running 5 plays for 66 yards for a Touchdown which put them up 14-7. The Warriors forced the Tigers to punt after 4 plays leaving them short of the first down, while the Tigers defense followed in the same suit forcing the Warriors to punt after just 5 plays. As the First Half came to a close, DeKalb County made a few short plays for first down before Jennings launched the ball to Patterson who was tackled on the 2 yard line for a 46 yard gain. The Tigers offense rushed to the line with about 3 seconds left in the first half and ran a fake handoff to Boss up the middle and Jennings completed the pass to Mooneyham in the end zone as the first half time expired. Poss kicked the extra point leaving the game tied at 14 to end the half. The DeKalb County offense started the second half off with 9 run plays between Boss and Jennings to move the ball inside the 30 yard line. Jennings makes a pass to DC receiver Jonathan Munoz then to Halfman to bring the ball to the 5 yard line which left it up to the strong running back Boss who punched the ball in for the first touchdown of the second half. That put DeKalb up 21-7. The rest of the third quarter and beginning of the fourth became a defensive game. The Tigers defense forced the Warriors to punt, then fumble, and caused them to lose a possession on downs for the next three series; being led by Jacob Hale, Austin Ellis, Joseph Pack, Lance and Lane Ball. The Warriors were down on the DeKalb County 11 yard line after a Poss 36 yard punt, they found themselves with a 3rd and 8. Hunter Kline, the Warrior quarterback, dropped back to pass throwing the ball to mid-field where the pass was caught by the Tigers Munoz. However when he was coming down with the ball the officials said he fumbled it, White County recovered and ran it in to their end zone leaving the score at 20-21 DeKalb County. The Warriors line up for a 2 point conversion and complete it putting them up by 1 point. The Tigers took over the ball on the White County 22 yard line with 1:10 left in the game. Jennings made a 5 yard completion to Boss then a 15 yard reception to Munoz followed by a White County penalty it brought the ball to the 50 yard line. Another pass to Munoz, then a quarterback keeper and a handoff to Boss left them inside the 3 yard marker. DeKalb tried to push it in with a run play and gained a yard but it was a difficult pass to Austin Brown that put them back in the lead. It was the first time the ball was thrown to Brown all night as he came across the end zone to turn and make a diving catch to put the game out of reach of the Warriors with 10.1 seconds on the clock. As the game looks on paper the Tigers offense exceeded the Warriors in both passing yards and total yards, as DeKalb County had 209 and 388 versus White County 34 and 227 yards respectfully. The Tigers went to Warrior territory used the clock to their and advantage and was able to leave White Count with their first win of the season. The win brings their record to 1-3 as they prepare to go to Cannon County to face district rival on September 19th at Woodbury, TN beginning at 7:00.